Tiger Leaping Gorge Sean’s package tour! This tour trip covers all Gorge views and it is the quintessential trekking trip for special people.Dear Travellers, welcome to travel with Sean's Eco-tour Real travel.This tour trip covers all Gorge views and it is the quintessential trekking trip for special people. Dear Travellers, welcome to travel with Sean's Eco-tour Real travel, real trekking, well also please be understand this is an independency trip in this area, not join with big tour group, away of from the crowded group and city to relax your all body, is depending on your condition design. The options were carefully planned with you and nature in mind. I believe this is truly a unique and special way to experience the beauty of Yunnan and the Tibetan area whilst supporting the rural economy and culture-exchange with the local minority people in a personal way. During each Eco-tour, you will be taught to help the local people in protecting nature and keeping the area clean, providing voluntary support to the local schools and sharing your time with young children and people with leprosy too. 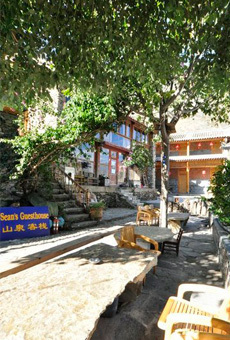 Package 1， Five Day’s Lijiang via Wenhai,Gorge Back to Lijiang. Day 1- breakfast at Lijiang, hiking about 4-5 hours to wenhai, lunch picnic, diner, sleep in Eco-tour G.H. Day 2-breakfast at Eco-tour G.H, hiking 5-6 hours down to longpan, lunch picnic, diner, sleep in Qiaotou hotel. Day 3 breakfast, start gorge hiking, lunch with Naxi family, dinner, sleep in guest house,have look the Service . Day 4- breakfast at tea house, walk to Sean's Guest House, lunch, dinner, overnight at Sean's . Day 5- breakfast at Sean's G.H, car to Lijiang, lunch, flight from lijiang to Kunming. Package 2， Two day’s trip from Lijiang via Gorge back to Lijiang. Day 1,early morning pick up from lijiang hotel, two hours drive by private car to Qiaotou, then half hours drive from Qiaotou to Sean’s Guest-house, have lunch (original western food). After lunch 2-4 hours trip hike down and back for the middle gorge to feel the gorge power. Over night in Sean’s place (over 4 star room). Day 2, have breakfast, 3hours hike up to the top back of Sean’s Guest-house Haba mountain hill peak(3000meters, Gorge is beautiful, but this trip is amazing view of all in this area trip), on the way view the local people’s farmer live and souse of walnut Garden, have pack lunch ,look over all Gorge of three sections point and all jade dragon snow mountain range wall. After lunch 2hours trek down back to Sean’s place, Dinner and over night in Sean’s. have look and link the Service . Day 3. early morning private car take to Lijiang or Shangri-la ! Package 3, Three day’s trip from Lijiang via Gorge back to Lijiang. Day 2, have breakfast, 3hours hike up to the top back of Sean’s Guest-house Haba mountain hill peak(3000meters, Gorge is beautiful, but this trip is amazing view of all in this area trip), on the way view the local people’s farmer live and souse of walnut Garden, have pack lunch ,look over all Gorge of three sections point and all jade dragon snow mountain range wall. After lunch 2hours trek down back to Sean’s place, Dinner and over night in Sean’s.have look the Service . Day 3, trekking around big waterfall with bamboo forest (the view over all the high trail and amazing), 2hours hike up over view all gorge, 2hours trekking cross waterfall and back to Sean’s place, Dinner and over night in Sean’s hotel. Package 4， Five day’s trip around Sean’s place. Day 1, pick up from Lijiang, two and half hours drive by private car to Sean’s Guest-house, have food, check time then doing some short walk, over night in Sean’s Inn. Day 2, have breakfast, 3hours hike up to the top back of Sean’s Guest-house Haba mountain hill peak(3000meters, Gorge is beautiful, but this trip is amazing view of all in this area trip), on the way view the local people’s farmer live and souse of walnut Garden, have pack lunch ,look over all Gorge of three sections point and all jade dragon snow mountain range wall. After lunch 2hours trek down to see the river power then back to Sean’s place, Dinner and over night in Sean’s. Day 3, trekking around big waterfall with bamboo forest, 2hours hike up, 2hours trekking cross waterfall and back to Sean’s place, Dinner and over night in Sean’s hotel. Day 4, have breakfast, half hour car drive 10km way, then doing the 5hours Gorge high trail trekking backwards to Sean’s place. On the way pass by Yacha village, Bendiwan village and 8 waterfalls, lunch in high trail, Dinner and over night in Sean’s hotel. Day 6, Have breakfast, trekking down to the Gorge river to fell the river power ,then come back about two hours trip, private car drive out to Lijiang ,Shangri-la or the other place ! !